(Rome 29 January 2019) UNIMED – the Mediterranean Universities Union – founded in October 1991 by Prof. Franco Rizzi, has been working hard in the last 28 years to foster Mediterranean academic integration and, in a wider sense, to promote values of solidarity and cooperation in the euro-Mediterranean basin. A task, a mission and an ambition that are becoming harder in recent times where walls are being created everywhere around the world. The significance to keep working in the direction of cooperation and integration are a need for many actors of the Mediterranean, that recognize the role played by UNIMED in that regard. This necessity is confirmed by the many Higher Education Institutions that choose to be members of UNIMED, as part of their current seek for alternatives to the disruptive drifts affecting the Mediterranean region. Among them, since 2018, the University of Pisa (Italy) has joined the network, as a sign of adherence to UNIMED’s mission in developing research and education in the Euro-Mediterranean area, and to contribute to scientific, cultural, social and economic cooperation. The growth in number of associates, along the almost thirty years of work and commitment towards a deeper integration in the Mediterranean, illustrates the importance acquired by UNIMED and constitutes a recognition of the efforts realised. An acknowledgement which is backed as well by the interest of European and International institutions that recognize the necessary role of UNIMED as a mediator in the region, as exemplified by the projects and academic activities accomplished . 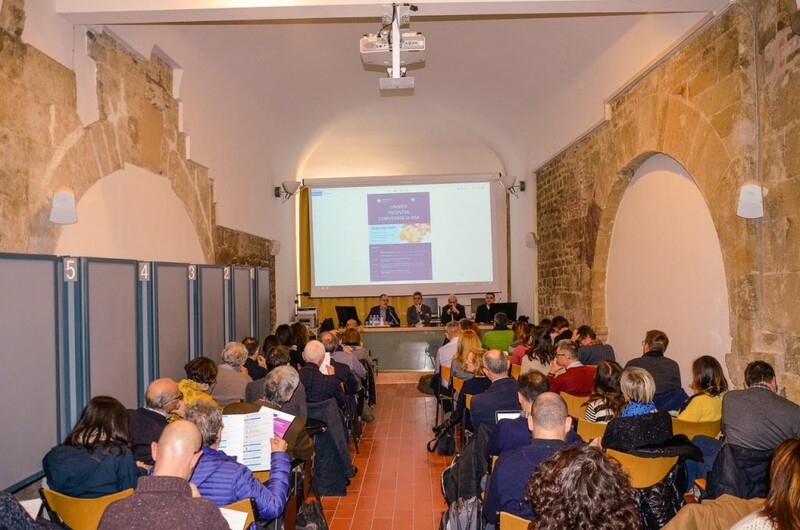 These are some of the points that have been touched upon by the Director of UNIMED, Dr Marcello Scalisi, during a conference at Pisa University on January 16th, 2019 where he presented UNIMED to the public, and talked about projects and activities of Erasmus+ Capacity Building involving Tunisian, Algerian or Palestinian Universities, as well as about the work being done with Iraqi or Syrian academic staff and researchers. Such progresses might seem difficult to conceive and realise, but they are happening thanks to the support of EU funding and the expertise of UNIMED in working on a local-based approach: this constitutes the message that Dr. Scalisi wished to share. On the occasion of formally welcoming the recent Italian member of UNIMED, Dr. Scalsi reminded how the growth in the number of associated universities (currently 113 from 23 countries of both shores of Mediterranean – data updated in November 2018) is the most important confirmation of the current need for common actions in name of the cooperation among peoples and cultures, as much from the educational perspective as through common projects. The presence of Prof. Lisandro Benedetti Cecchi and Prof. Francesco Marcelloni, respectively Vice Rector for European and International Research and Vice Rector for International Relations and International Cooperation set the frame for a future of collaborations and participation of UNIPISA in the activities of UNIMED. A productive debate with wide participation, was preceded by the speeches of other institutional representatives of the University of Pisa and the services for the cooperation, training, mobility and research services, Mr. Tommaso Salamone and Mr. Michele Padrone – both Heads of Units. It is possible to access here the full programme of the event and the presentation material.